Speckle Interferometry with mid-sized amateur telescope: why not? This talk shows how using interferometry methods provides routinely accurate measurements with a mid-sized amateur telescope. It is illustrated by the implementation of a homemade 410mm telescope dedicated to double stars measurements and highlights the most important practical tips. The results of a 1000 measurements campaign are briefly discussed. As a part of the solutions used during this campaign, a focus is made on the new version of Reduc software now including interferometry reduction routines. This version will be released to the public after the meeting. Interferometría con un telescopio amateur: ¿por qué no? Esta comunicación muestra cómo los métodos de interferometría permiten la obtención rutinaria de medidas de calidad con un telescopio amateur. Este hecho se ilustra mediante el uso de un instrumento de 410 mm de diámetro dedicado a la medición de estrellas dobles y se resaltan los aspectos prácticos más importantes. Los resultados de una campaña de 1000 medidas son brevemente discutidos. Como parte de las soluciones utilizadas en el curso de esta campaña, es remarcable la nueva versión del programa Reduc que ahora incluye técnicas de reducción de medidas interferométricas. Esta versión estará disponible públicamente después del meeting. The speckle interferometry is a favorite professional tool for measuring double stars. Some rare amateurs use this technique on missions in observatories, but none seem to use it routinely with a classical amateur instrumentation. The border between the two groups obviously depends on viewing conditions, it is usually around 20 to 30 cm in diameter. When the seeing limits the resolution, the conventional imaging fails to provide measurable images of close pairs. Does the speckle interferometry brings a solution for amateurs as it does on the big professional instruments? The answer is yes. The purpose of this discussion is to share with you a resolutely practical point of view that justifies this response. 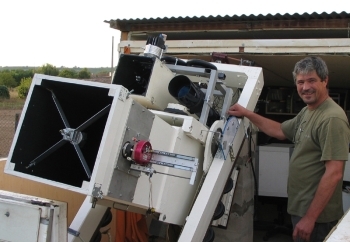 Karl Ludwig Bath in Namibia operates on the IAS 50cm Cassegrain and Francisco Rica Romero did some runs on the 40 cm Schmidt-Cassegrain at the Observatorio Astronomico de Cantabria. B. Trégon and M. Castets published works led on the T60 at Pic du Midi observatory. When I built my 400mm telescope in 2008 to replace the old T200, my goal was to obtain measurements of moderately faint and close double stars (mv ~ 11.12, rho in the range of 1"to 3"). Given the usual conditions on the site, I did not think I would be able to obtain regularly good measures on closer pairs. The observatory is located close a major river and at an altitude of 20 meters, conditions less than ideal for high resolution. The instrument is a Newtonian telescope, the main mirror has a diameter of 408mm with an optical focal length to 2052.5mm. The minor axis of the secondary mirror is 72.5mm. The first light took advantage of exceptionally calm sky and the telescope showed that observations limited by the diffraction can be achieved. Obviously it's very different when normal conditions are restored and scintillation, agitation and spreading play their symphony. 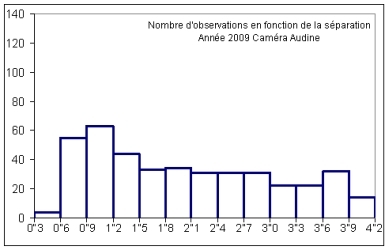 The first camera used on the T400 is an Audine camera shipped with a KAF400 sensor (matrix 768x512, 9 microns square pixels). It is installed behind a Televue 5x optical amplifier, the effective focal length is 11.96 meters. 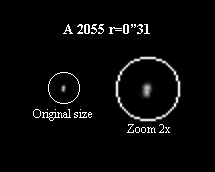 Using conventional imaging (manual selection of the best images and shift-and-add) measuring couples beyond 1"3 is generally quite easy. With tighter couples we must make a severe sorting in order to find some measurable images. Using the lucky-imaging technique imposes to image at least a thousand frames to have any chance of finding enough correct images. This is a problem with the Audine whose readout rate is low. Getting 1000 images requires 40 minutes! It's enough to discourage the most stubborn observers. The minimum exposure time set by the shutter of the camera is 60 ms. It's too long to freeze the fast motion of the atmosphere and this further reduces the chances of finding good images. One can speaks of miracle-imaging! However 60 ms is fast enough to see a speckled structure blurred by the fastest movements of the atmosphere. These blobs are formed when individual speckles are merging when exposure time is too long. These "super speckles" (the term is borrowed from Christian Buil) carry, however, essential information on the relative position of components. HU 987 r=1"09, the phenomenon is clearly visible on the animation. Under these conditions and despite the large separation there are only 2% of usable images. The best image of the series is at the center, it is difficult to measure. 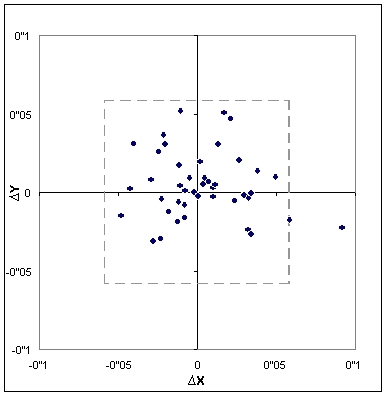 Right: an autocorrelation image obtained with Reduc. 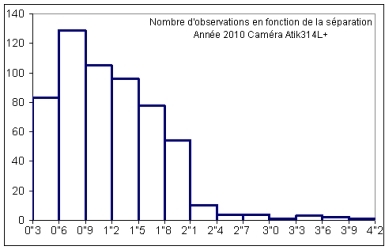 Some hundreds of images are sufficient, typically 200 to 400 for an autocorrelogram. Even with the slow readout rate of the Audine 4 pairs per hour can be visited, enough to give courage again to the observer! 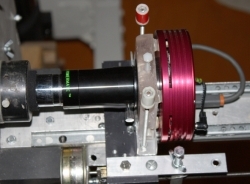 Measurements are possible up to about 0 "6, twice the resolving power of the telescope. Measuring with confidence below this limit requires excellent weather conditions. This is again Gamma Virginis Audine imaged with the Audine camera in 2009. The images are unusable with the conventional techniques of shift and add. 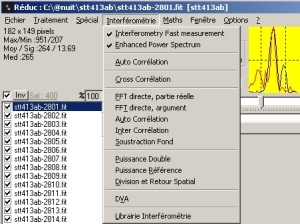 Treatment with autocorrelation makes measuring easy. Thanks to smaller pixels, the sampling is smaller and the focal length remains reasonable. The readout speed is comfortable: 3 to 4 frames / second when defining a window of 128x128 pixels at the center of the sensor. The major advantage is the shutter speed. Exposure times are typically 20 ms for stars of magnitude 10 and can be downsized to 1ms on the brightest targets. 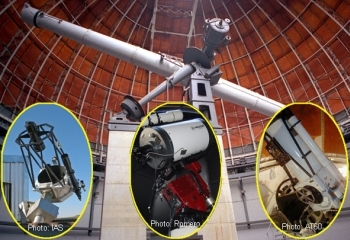 With these features, we work more closely to the usual conditions of speckle interferometry. The pictures are better structured and speckles are fine. 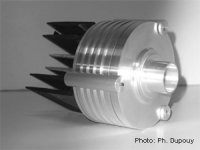 The performances improve and 70% of the measurements are carried out between 0"3 and 1"5. All reductions are made with a version of Reduc dedicated to speckle interferometry. It implements the autocorrelation functions, cross-correlation and DVA. The measurements are routinely performed on the autocorrelation image. The ambiguity of 180 ° is solved by creating a cross-correlation image or a composite image when possible. After processing a series of images Reduc provides an autocorrelogram and a series of images that are processed by subtracting a mean mask in order to reveal the peaks. The mask must be adapted according to the optical configuration. With the T400 at F/D=30, the best results are obtained with 3x3 and 5x5 cores. Left: the peaks are hardly visible on the autocorrelogram. Left: the autocorrelogram used for the measurement. (*) the cross-correlation should show the brightest and faintest peaks oriented respectively to the true PA.
Reduc swaps the image in order to put the brightest peak in the quadrant where the secondary is located. I find this very comfortable when using the one-click measurement feature (see Reduc users manual). The calibration remains the cornerstone of any measurement, it is probably the biggest problem with amateurs instruments. The T400 is on a stable mount and the camera stays in place for several months during the campaigns of observation of double stars. It seemed stronger to make an independent calibration rather than using the traditional method of standard stars. It is determined in three steps. In the first step the camera is placed at the prime focus and records series of images of several stellar fields containing random pairs of stars of near equal magnitudes, separated by a few arcseconds and oriented in various directions. During the second step the same fields are imaged using the measurement setup. Finally, all the couples present on both sets of images are reduced by using a whatsoever sampling value (other than zero!). Each pair has a separation df at prime focus and dm with measurement configuration (ie with the focal amplifier, filters ...). The ratio dm/df provides the scale factor between the two configurations. By applying this scale factor we deduce the effective focal length of the measurement configuration. Obviously it works only when the focal length of the prime focus is perfectly known. Take care with commercial telescope and control yourself ! The east/west axis is determined by the method of stellar trails. The camera and optical train are installed so that the only possible movement is the rectilinear translation needed for focusing. The whole setup remains in place during all the campaign, the calibration is performed over several nights of good seeing. Uncertainty about the direction of the camera is about 0°2. Might be difficult to obtain a good calibration tonight. The observation campaign was conducted in two phases. The results are summarized in the table below and detailed measures are published in Observations et Travaux #75. Another positive aspect with the use of interferometric techniques: the number of nights observed is greater, about 120 nights / year, it was 80 nights / year before using interferometric techniques. The bar graphs show the evolution of the observing program. During 2009, measurements are initially carried out on a wide range of separations in order to validate the procedures. The reduction with autocorrelation partially overcomes the turbulence. This is the era of "super speckles". With the limits of the equipment the measures below 0"6 are exceptional. By 2010, the equipment is better suited to work with speckle interferometry. The observing program dramatically shifted towards the lower separations. The measures below 0"6 become routine. The average position error is ~ 20 mas. What is remarkable is that it is not necessary to use high-end cameras and the latest technology to work routinely at the resolution limit. This is probably the most important lesson I retain from this experience. Amateurs who own a telescope larger than say 12" or 14" sometimes get frustrated of being limited by the atmosphere. The application of speckle interferometry methods will give them the greatest satisfaction!